We are passing along information about this amazing event -- March 9 - 13 will be Share A Story - Shape A Future week for all kidlit bloggers and readers. It is a blog tour event for literacy that just shouldn't be missed!! The information below came from the "home" blog for this event. "Within the kidlitosphere, the children's literature bloggers comprise and reach a very broad audience. One of the group's greatest assets is its collective, community-minded approach to sharing information and ideas. Through events like blog tours, authors and illustrators have had wonderful opportunities to share their story and their craft. Given the success of tours for "producers," what about an event for and by the people who create and engage their readers: teachers, librarians, parents, and people passionate about literacy? Through Share a Story - Shape a Future we hope to build a community of readers, by sharing ideas and encouraging each other. When the event opens on Monday, March 9, 2009, there will be plenty of opportunities for you to join us and share your ideas." It seems that Karen and all of our central Ohio blogging friends have pretty much covered the big Dublin Lit Conference of last Saturday, but I'll add my two cents worth too. The conference was 20 years old this year, I've been teaching in Dublin for 25 years, I've attended the conference 3 times, and this year was the first time I spent the whole day. I'm glad I did! I served on the planning committee this year as my school's rep, check out the big tricked out name tag. I took on the job out a sense of obligation, but completely enjoyed myself and look forward to n ext year. The highlights for me this year included listening to Barbara O'Connor talk about boiled peanuts an other southern delights. I was a bit surprised to hear her southern accent since she lives in Massachusetts. What a wonderful 45 minutes! Barbara shared stories of her career and read from her new books. I think I like her books even more now that I've met her and listened to her share. I've been talking about "writing what you know" with the kids preparing for our James Preller visit, and Barbara gave me one more story to share from a real author. That's me with Barbara and Mary Lee from A Year of Reading. I presented for the third time, unfortunately my blog partner Karen was unable to participate but, I muddled through. There were about 25 people in my session, up from last year's 10. I hope I didn't talk too fast as I flew through as many book titles as I could in 45 minutes. There was no formal evaluation of the session, but judging from the smiles, I think it went pretty well. I know I certainly enjoyed myself! Finally, I got to spend the day hosting children's literature icon, Johanna Hurwitz. What a pleasant, friendly lady. She was joined by a friend who lives in the area, so my job was pretty easy, but I did get to spend quite a bit of time listening to her stories and experiences. I was so impressed when people she met on an author visit 17 years ago came for an autograph, and Johanna remembered them. It was also so wonderful to see teachers come for an autograph carrying her books that they read when they were kids and are now using in their classrooms today. What a legacy. 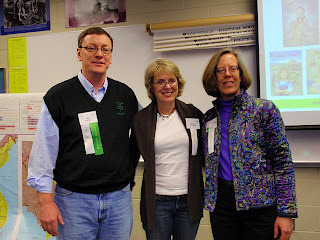 This past Saturday was the 20th Dublin Literacy Conference here in Dublin, Ohio. I am not one of the committee members who tirelessly plan and organize this wonderful conference every year, but I am one of the people who love to attend for all the fabulous thinking I know I will hear. Last year, Bill and I did a presentation on new book titles that we loved from 2007 - 08. This year, we were scheduled to present again, but due to a medical illness on my part, Bill presented on his own (sorry, partner!). Even though I knew I couldn't prepare for a presentation, one of my all-time favorite authors was going to be at the Conference. That's right -- the one and only Barbara O'Connor was here! My friends on the committee helped arrange it so I could come and meet Barbara during her lunchtime. Bonus for me was that Grace Lin sat with us, as well. Pinch me -- I must be dreaming!! Mary Lee, from A Year of Reading, was with us as well. What a delightful lunch conversation we had! For anyone that follows Barbara's blog, or reads her books, she is just as lovely in person as she is in writing. I felt like I had met someone who was a long, lost friend. We had so much in common, especially how we both need to "rechar ge our batteries" with quiet, and how much we both love our screened porches. So that's all I have about the Dublin Literacy Conference -- I finally met Barbara O'Connor and loved her, and I got to meet Grace Lin, also. For more deep thinking about the conference, check out what Franki, Mary Lee, Kristine, or Katie had to say. For just some fun pictures, take a look at Bill and me with the lovely Barbara O'Connor. In addition, some of the Central Ohio bloggers were found at the same place at the same time -- another picture! What an incredibly beautiful book this is! The pictures are amazing and the story is simple and so well written. 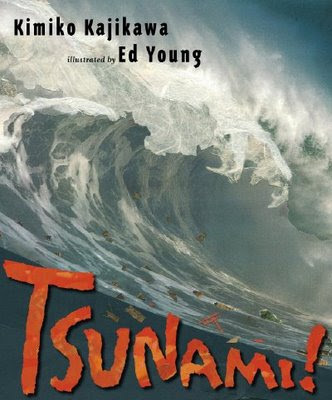 It may be early in 2009, but I'm starting my Caldecott short list with Tsunami by Kimiko Kajikawa and illustrations by Ed Young. The wise old rice farmer called Ojiisan, grandfather, by the villagers lives in a simple house on a hill overlooking a village. Well respected by the villagers due to his humility and success, Ojiisan chooses not to attend the festival of the rice harvest because, "something does not feel right." When earthquakes begin during the festival, Ojiisan knows that a tsunami is on the way. He observes the movements of the ocean, and even though he has never seen a tsunami, he remembers the way his grandfather described the sea running away from the shore as a sign of a coming monster wave. In order to draw the villagers to safety, Ojiisan sets his own rice fields on fire. When the villagers begin to arrive to battle the fire, Ojiisan demands that they let it burn until all are safe on the hill. The dreaded tsunami hits, destroying the village totally and Ojiisan invites the villagers to stay with him until they can safely return home. In the end, a temple is built to honor Ojiisan and unselfish act. Ed Young, Caldecott winner for Lon PoPo, has created incredibly detailed collages of torn paper and other materials that bring the village and it's destruction to life. The cover alone is a work of art and the following pages get better with every turn. I can't wait to share this gorgeous creation in THE PIT. So with James Preller's visit just over a week away, I've been preparing the kids with a preview of his new book and some background info from his blog. 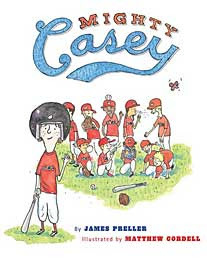 Mighty Casey is to be released on March 3 which just happens to be the day of the visit, so we were able to get our hands on a galley copy of the new book. I've been reading it in THE PIT over the last rotation of days and it's been a hit. The kids laugh at the right places, like when the left fielder answers the call of nature in left field, and they get excited when the Delmar Dogs tie the game. In fact, the wave has been known to break out in THE PIT! Matthew Cordell's illustrations are simple and fun to look at, the younger kids love reading the sound words like POW! When the big hit is made...and yes... they read it loudly and with great feeling. Makes a librarian proud. Oh, and for the record, this book would have been PICK FROM THE PIT regardless of whether James Preller was coming to town or not. I'll be presenting at the big Lit Conference in Dublin tomorrow, visiting authors include Barbara O'Connor, Johanna Hurwitz, and the Sisters, just to name a few. I'm looking forward to it, and maybe I'll run into some of you there, be sure to say hello if you see me! The girls at my school are always asking for "tween" novels in the library and I am always hesitant to purchase them for our collection. Most that I have read are, in my opinion, not appropriate for a school library. Now, before we get to the whole censorship issue, because of space, public opinion, budget and other constraints, school librarian, especially elementary school librarian need to be a little careful when selecting titles for the collections. So I have purchased very few of this genre for our school. Talia Talk by Christine Hurley Deriso deals with the friendship changes that await the girls going to middle school. Talia Farrow is an 11 year old whose mother hosts a local morning news show. Her mom is constantly sharing stories about Talia which embarrass her. Stories involving crayons up the nose and vomiting on her piano teacher that make Talia cringe when she thinks about them. Talia's best friend, Bridget, is determined, confident, sometimes bossy and when they hit middle school she encourages Talia to sign up for the morning announcement TV show called the Broadview Middle School Oddcast, even though Talia isn't sure she wants to. Bridget is my favorite character, she's funny, and not afraid to express herself regardless of what people think. Of course, it wouldn't be a tween novel, if there wasn't any tween angst. Meredith and Brynne are former BFFs with Bridget and Talia. As the girls enter middle school, these two decide they are too cool for Bridget, but might be able to put up with Talia if she abandons her friendship with Bridget. I know, typical story line for one of these books, but from personal experience as the father of a high school daughter, typical story line for real life too. Predictably, they all four make the staff of the news broadcast and the two tween queens scheme to get Bridget fired as the director by circulating a petition. In order to get a majority, Meredith bribes one staff member with an invitation to her birthday party and it comes down to whether Talia will sign or not. The birthday party is THE social event of the season complete with DJ, strobe light and dance floor. Meredith is registered at the hottest clothing store and expects all gifts to come from her list. Christine Hurley Deriso does and exceptional job of making these girls seem snobby and mean without crossing the line of realism. Everything she writes is dead on correct about how some middle school girls act. In addition to this story line, Talia's father died of cancer four years earlier and her mother re-enters the dating scene. While this plot could stray into the "soap opera" realm, the author does a nice job of keeping it as light as possible and blending it with the rest of the story. All in all, Talia Talk does an excellent job of storytelling, problem solving and helping young girls look at real situations with real solutions. Will it win any awards? Probably not, but I'm sure girls in the fifth grade will love it. It's time to start publicizing our next Grand Discussion and Joyce and I like to get creative, or silly, and have a little fun with them. For example, when we used the book Hattie Big Sky, we cut and pasted our faces over American Gothic with speech bubbles. Joyce: Look at that sky. Yeah, I know, corny, but we laugh like a couple of goofs anyway. When we chose Al Capone Does My Shirts, we sat on the steps of our playground. The railing has bars so it looked like we were in jail because of boring books. Then we freed ourselves over the joy of reading and discussing such a wonderful book. Our original flier had us sleeping while holding a boring book and then perked up and awake due to a really good book. The funny thing was, we were holding the same book in both photos. Two unnameable teachers invite you to join them for a Grand Discussion of The Unnameables by Ellen Booraem. And the picture? Well take a look for yourself. A couple of funny things, Joyce and I both caught ourselves smiling under the bags as if our faces would be seen. One fifth grade student who was in the library at a time suggested we take it again because, "Mr. Prosser blinked!" We may send it to Chipotle and see if they might provide some snacks for our discussion. All in all, another good time was had by all, well at least by my friend Joyce and me! I haven't shared what I've been reading in THE PIT recently, so here goes. By the way, check out the new PIT picture. My aid, Yvonne, found these big rub on letters so it's official, WELCOME TO THE PIT! As Good As Anybody: I n January we celebrated Martin Luther King Day with this beautiful book. I really liked it because it told a story of Dr. King that wasn't familiar to me. Richard Micholson's words and Raul Colon's illustrations combine to tell of the friendship between Martin Luther King, Jr. and Rabi Abraham Joshua Heschel. ALL of the kids got the common experiences of these two men and how they brought them together. The House in the Night: I wasn't crazy about this one, and after about 20 or so readings, I still can't say I love it, but it did win the Caldecott and so I shared it. Some of the kids really liked the soothing words and pictures, others, like me, still don't get it. Are You Ready to Play Outside? Mo Willems did again. I love the Elephant and Piggie series, and so do the kids. It didn't hurt that this won the Geisel Award this year. I never get tired of these two characters, and the kids laughed out loud. I may pull these books together this spring for a little reader's theater. Could be fun! Chicken Cheeks: My friend Franki at A Year of Reading showed this to me on a recent trip to Cover to Cover. She thought it was "my kind of book" and guess what!? She was EXACTLY right! You have to love a book with things like Penguin Patooties, Kangaroo Keisters, and Hound Dog Heinies in it! We all laughed at the words and the hilarious pictures. It's ornery, and I like it! Go HERE for a funny video of author Michael Ian Black reading his book wearing a chicken suit. After the intense month-long reading during Looking for Newbery, then 2 nights of parent - teacher conferences this past week, and finally planning our blog birthday celebration, I decided to relax and reward myself with a trip to the library Saturday morning. I went to the "new book" bookcase, and left with two books that were just published this month -- so I'm talking "seriously new" books! 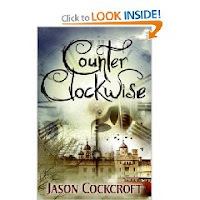 The first book was Counter Clockwise -- a first novel for Jason Cockcroft (he has illustrated other picture books). "What if your mother were hit by a bus? And what if your father disappeared one day through a hole in the bathroom wall? Is there a way to change the course of your life's history? What if time moved Counter Clockwise?" Intrigued? I certainly was. And a book about time travel is not something that would usually appeal to me. Not even a little. But, the inside flap hooked me, and I put it in my pile to be read, checked it out, and went home to read it. Another confession to make -- I read too fast sometimes. Hint: that is not necessarily a good thing with this book. Each detail of Counter Clockwise has nuance; everything is important. I have already had to go back and reread several parts to make sense of details of new situations that occurred later in the story. When I finally put this book down, I felt short of breath. The story was mesmerizing, the characters were fascinating (and multi-dimensional, depending in which time continuum they are viewed), and the action was fast-paced. I literally heard myself gasp at least twice. The flap says this book is for Grades 5 and up -- I think that's a good call. Because the story is set in England, readers will need to bolster their background knowledge. For instance, one of the main characters is a Beefeater -- pretty important to know what that means in order to understand his attire, and his purpose in the story. However, that being said, Counter Clockwise will be the first 2009 book I actually purchase for my own classroom. It's just that good. Time to Blow out the Candles on our Birthday Cake! Bill and I would like to blow out one candle for each of the last 12 months that we have been blogging. Each candle will represent a post from that month that we really liked, or with which we were pleased. Karen - This post has to rate as a favorite since it really introduces me, and explains how much I love literacy!! Plus, it was my first post ever. There's a sort of sentimental attachment to that. Bill - A Couple of Boys Have the Best Week Ever, who knew then that it would be a Caldecott Honor book. I just re-read my post, I wish I had just made a mention of the medal so I could claim some credit. Karen - I fell in love with this book by Kadir Nelson -- I was so happy that it received multiple awards at the ALA convention. The fact that the author/illustrator is easy on the eyes is just icing on the cake! Karen - My post on Greetings From Nowhere was the first time I received a comment about one of my reviews from an author. I was already a fan of Barbara O'Connor's, but that small gesture on her part just cemented my membership in her fan club for life! She'll be at the Dublin Literacy Conference this month, and I look forward to finally meeting her in person! Bill - Cool Daddy Rat was so much fun in THE PIT, that I laughed about it when I found this post. May '08 -- 4 months old! Bill - My buddy Vince introduced me to a great book and reminded me why I love my job in this Slice of Life post. Karen - I first posted about The Gollywhopper Games in March, but revisited it in May after many of my students shared how much they loved it. Jody Feldman wrote an intricate, yet incredibly fun book! Kids loved it! June - Summer begins and we're still blogging -- 1 more candle to blow out!! Karen - This candle is definitely for the 48 Hour Challenge weekend extravaganza. Not only did I participate in Mother Reader's challenge, but I met some wonderful Central Ohio bloggers as well. I feel very fortunate! Bill - This post came about a week before we left for Boston for the first time and it turned into a nice email conversation with the author. Bill - I know it didn't win any shiny medals, but Diamond Willow is still one of my 2008 favorites. Karen - I found the first book in a new series by Margaret Peterson Haddix that I loved! Can't believe the next book doesn't come out until this spring! Karen - Franki and Mary Lee at A Year of Reading hosted Trading Spaces, and I was delighted to be a part of it! Bill - Beware of the Frog in THE PIT! Lots o' fun and I heard the kids in Ashland like it too! Bill - I like the Ellie McDoodle books a lot, and I think the second is better than the first which is a bit unusual. Karen - I was so delighted when I got an opportunity to read an early copy of Beyond Leveled Books - Second Edition written by two friends of ours. Definitely a highlight of this month! October -- jack 0' lanterns, Halloween costumes, lots of candy, and yet another candle to blow out! Karen - One of our first read alouds this fall was The City of Ember, and we followed it up with a trip to the movie theater to see the movie of the same name. Loved sharing what my students had to say about the movie vs. the book. Bill - As the day grows closer and the stress gets a little higher, my excitement for our James Preller visit increases. Bill - Twelve Terrible Things makes me laugh, and a Grand Discussion reminds me once again why I love my job. I know that's two, but I couldn't decide! Karen - I was not a very active writer this month, but this piece sort of stayed with me because I committed to going to NCTE for the first time in November 2009 in Philly! We will have a great time! Karen - We came up with the best idea for trying to read the Newbery in a month -- Looking for Newbery. Bill - Fun and games while learning to find books in the library!? That's AMAZING! Bill - A Newbery review of one of my favorites of the year. Karen - One of my favorite books for 2008 made me laugh while Looking for Newbery! Great language as well!! It has been an awesome year of blogging for both of us. It's been fun reading and writing about good books and our experiences with them in the classroom. We have really enjoyed your comments which have always made us feel what we are doing is worthwhile. It's nice to feel like people care about what you say. Keep reading, and we'll keep writing. Today is our one year blog birthday! It is hard to believe that we've been blogging together for a year! A little more than a year ago (Groundhog's Day 2008), Mary Lee from A Year of Reading met us at a local Panera, and guided us through the basics of Blogging 101. After that, it was up to Bill and me to come up with ideas to write about and books we loved that we wanted to review. Quite the challenge for novice writers! So, here we are one year later, and so very grateful for the journey we've had this past year!! Because it is a Friday (and we just completed 2 nights of parent-teacher conferences and Book Fair), we've decided to just open some presents, and have a little ice cream today on our actual birthday, but we'll be back tomorrow to blow out the candles on our cake. We will be blowing out one candle for each month we've been blogging. We hope you join us for that part of our celebration. Thanks for visiting us this past year. We hope you continue to visit us in the years to come!